I’ve just finished The Murder of Mary Russell. Wow. It’s … fantastic. I get nervous with Laurie R King’s new books in her beloved Mary Russell – Sherlock Holmes series. This is book 14 of the long running series. Sure, I love some books of the series better than others … but this book was marvelous and absolutely the follow up I needed (as a fan) after Dreaming Spies, Garment of Shadows, and (deep breath), The Pirate King. After a deadly confrontation, readers are drawn through the history of one of Sherlock Holmes’s earliest cases and the true background of the fascinating Mrs Hudson(! ), and the true nature of her relationship to Sherlock. We even get a bit of King’s take on a Sherlock Holmes not long before his arrival at Baker Street. I know I could read a *lot* more in that vein. Maybe someday King will give us a little more. About half-way through this latest of the series, I had an idea that though I was enjoying it, The Murder of Mary Russell would only appeal to the die-hard fans of Mary Russell and maybe those true completists of Sherlock pastichery. And a few unbranded #histofic mavericks. After all, we’re delving deep — real deep, into the supporting cast of the series, usually territory for only the most devout readers of fanfic and scholars of minutia. However, after that half-way mark (or so), all that build up became more and more meaningful, reaching deep into the story of King’s Sherlock, which incidentally, is among my favorite interpretations. We’re also (mostly) but not entirely back in London and Sussex for this tale. If you’re among the legions of King’s readers who love the globe-trotting nature of Russell and Holmes’s lives, you shouldn’t feel too cooped up, after sojourns at sea and a bit of time in Australia during the days of Transportation and gold. So, a spoiler free review, given how little I can tell you, given that title. Yikes. Read The Murder of Mary Russell and see how the world of Sherlock and Mary Russell is changed forever. Disclosure: I received a free advance ebook copy for review. Like this? Subscribe to my newsletter. I've just finished The Murder of Mary Russell. Wow. It's ... fantastic. 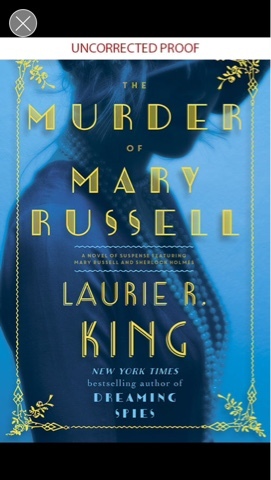 I get nervous with Laurie R King's new books in her beloved Mary Russell - Sherlock Holmes series. This is book 14 of the long running series. Sure, I love some books of the series better than others ... but this book was marvelous and absolutely the follow up I needed (as a fan) after Dreaming Spies, Garment of Shadows, and (deep breath), The Pirate King. After a deadly confrontation, readers are drawn through the history of one of Sherlock Holmes's earliest cases and the true background of the fascinating Mrs Hudson(! ), and the true nature of her relationship to Sherlock. We even get a bit of King's take on a Sherlock Holmes not long before his arrival at Baker Street. I know I could read a *lot* more in that vein. Maybe someday King will give us a little more. About half-way through this latest of the series, I had an idea that though I was enjoying it, The Murder of Mary Russell would only appeal to the die-hard fans of Mary Russell and maybe those true completists of Sherlock pastichery. And a few unbranded #histofic mavericks. After all, we're delving deep --- real deep, into the supporting cast of the series, usually territory for only the most devout readers of fanfic and scholars of minutia. However, after that half-way mark (or so), all that build up became more and more meaningful, reaching deep into the story of King's Sherlock, which incidentally, is among my favorite interpretations. We're also (mostly) but not entirely back in London and Sussex for this tale. If you're among the legions of King's readers who love the globe-trotting nature of Russell and Holmes's lives, you shouldn't feel too cooped up, after sojourns at sea and a bit of time in Australia during the days of Transportation and gold. With a lead-in like that, I had high expectations. That and this is Lyndsay Faye we’re talking about, the creator of the marvelous Timothy Wilde series, and the one who finally gave us a gripping account of Sherlock Holmes vs. Jack the Ripper that frankly is better than anything Conan Doyle would have come up with. Jane Steele is a fun, action-filled homage to the Gothic triple deckers of the Victorian age. It has the classic tropes: Girl orphaned young, named Jane, abused by the wealthier kinfolk she lives with, sent away to horror-show school and becomes governess … I go into books labeled ‘reimaginings’ with gun-shy wariness. Like satire, it can be a fine line between brilliant and obnoxious, too cute or cloying. Steele is not a satire of the genre, but it is sly and winking, more like a quiet unspoken joke between old friends. Jane Steele is even published as a triple decker — thankfully under one cover. It’s action-filled and just tons of fun with some great characters I deeply hope to see again. Steele, is also unflinching from the ugliness in ugly people, and hardships of the time. Some of that ugliness is only hinted at in those classic Gothic novels we love, but here if someone is a sexual predator, it’s said/shown. Anyone shying away from the ‘serial killer’ tag — I think it’s not used well here. Jane Steele isn’t a serial killer. More like a vigilante, or frankly just someone who lives in hard place during a hard time. The violence is largely unflinching, but far from Tarantino-esque. This isn’t a cozy knitting mystery, but I think the majority of readers won’t be put off by the violence. Faye’s descriptions are gold, building tension then giving readers that pinching little twist of anticipation making payoffs that much sweeter. Book to book, she just gets better and better. Jane Steele comes out in March, and available for pre-order now. With a lead-in like that, I had high expectations. That and this is Lyndsay Faye we're talking about, the creator of the marvelous Timothy Wilde series, and the one who finally gave us a gripping account of Sherlock Holmes vs. Jack the Ripper that frankly is better than anything Conan Doyle would have come up with. Jane Steele is a fun, action-filled homage to the Gothic triple deckers of the Victorian age. It has the classic tropes: Girl orphaned young, named Jane, abused by the wealthier kinfolk she lives with, sent away to horror-show school and becomes governess ... I go into books labeled ‘reimaginings’ with gun-shy wariness. Like satire, it can be a fine line between brilliant and obnoxious, too cute or cloying. Steele is not a satire of the genre, but it is sly and winking, more like a quiet unspoken joke between old friends. Jane Steele is even published as a triple decker --- thankfully under one cover. It’s action-filled and just tons of fun with some great characters I deeply hope to see again. Anyone shying away from the ‘serial killer’ tag -- I think it’s not used well here. Jane Steele isn’t a serial killer. More like a vigilante, or frankly just someone who lives in hard place during a hard time. The violence is largely unflinching, but far from Tarantino-esque. This isn’t a cozy knitting mystery, but I think the majority of readers won’t be put off by the violence. The Fellowship of American Bibliophilic Societies (FABS) is a loose association of book collecting clubs. ..